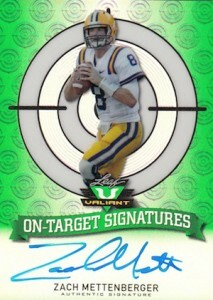 2014 Leaf Valiant Football returns as an all-autograph release focusing on 2014 draft prospects. And while the glimmer and shine may be similar to previous years, it should no longer draw many comparisons to Crusades inserts of the past. 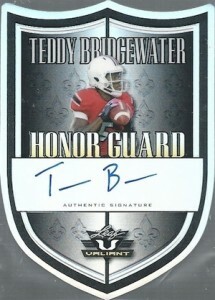 Every box of 2014 Leaf Valiant Football comes with four cards. All are signed. Leaving behind the regal lines of past Valiant sets, base autographs have a large star in the background. The change seems more cosmetic than anything though, sort of like a brand evolving. The brand's rainbow of colored parallels remains in tact. 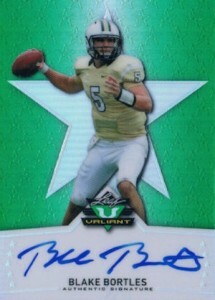 In addition to base autographs, 2014 Leaf Valiant Football has five autographed inserts. In the Spotlight focuses on the top players heading into the NFL Draft. Lightning Fast looks at some of the speediest prospects. On Target returns, highlighting the key quarterbacks of the 2014 rookie class. Honor Guard and Rising Stock both have die-cut designs. 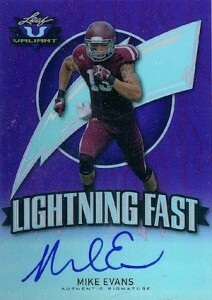 Like base cards, all autographed inserts come with multiple levels of parallels numbered as low as one-of-one. Johnny Manziel, Blake Bortles, Jadveon Clowney and AJ McCarron are among the players signing for the set. 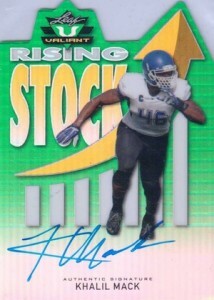 2014 Leaf Valiant Rising Stock KHALIL MACK HARD AUTO ROOKIE RC REFRACTOR HOT !! For the money, this is as good as it gets. Leaf did a great job of releasing short print info quickly. Love the “refractor” fronts. 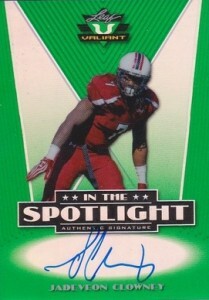 On-Card autographs, minimal flawed cards. Just an overall nice value.